It’s hardly surprising that this Mermoz Round Crochet Bag is so popular and it’s a fabulous Free Pattern! This Aviator Bag is a definite must make. Get the details now. This Mermoz Round Crochet Bag has taken the Crochet Community by storm and is it any wonder. This is the work of talented creator Hyke Groen of Bizzy Hands and we were excited by the detail in her creation. Mermoz is French for ‘Aviator’. This bag is perfect for overnight stays or your yarn. The combination of striped handles, button loops and crochet bubble sides are quite breathtaking. We know you’ll be keen to try out your skills with this gorgeous Project. The Mermoz Round Bag looks great in plain colors too. Let your hook run wild and create your own combinations. 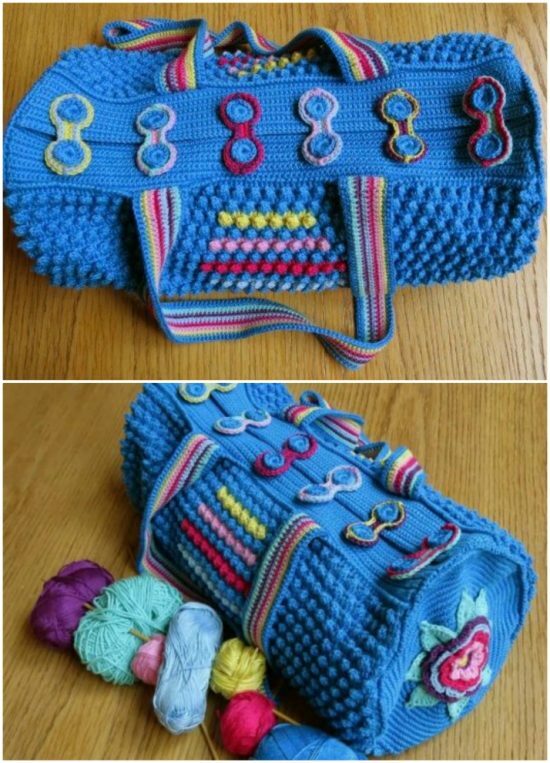 Hyke has created an excellent tutorial to make her stunning Bag.